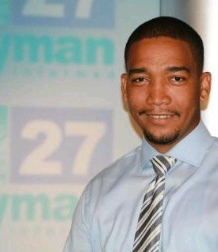 (CNS): Caymanian television news journalist Kenneth Bryan has resigned from his job with Cayman 27 because he is considering running for election next year and believes it would be unethical for him to remain on the news stations team. Bryan, who is 31, said that he has not yet made up his mind about entering the political fray but he admitted he is giving it serious consideration. Refusing to be drawn on which of the parties he hopes will invite him to run on their ticket or if he favours an independent approach, Bryan said he had plenty of time to consider his options. Speaking on Monday at a press conference at the station where he has worked for the past four years, Bryan said that he wanted to address the rumours already spreading that he would be a candidate in the next election. Given that he is giving it genuine consideration, the local reporter from George Town said he felt the right thing to do was to tell his TV bosses and hand in his resignation because of the nature of the work, which involves political reporting. Although Bryan said he believed he was capable of remaining objective, some may use the fact that he is considering a future in politics to discredit the local media house and the information reported in the daily news slots. “That information is way too important to put at risk, especially in this current political environment,” he stated. Bryan added that although he had resigned from Cayman 27 over issues of the station’s credibility, he intends to remain in the news field until he makes his decision regarding the elections. He said he would be freelancing and would, therefore, avoid any concerns that his views could be interpreted as those of any other media house. If Bryan does make a decision to run in the May 2013 general election, although he will only 32 if elected he would not be the youngest MLA to sit in the Cayman Islands parliament. Education Minister Rolston Anglin was elected to his seat in West Bay at only 28 years of age. Okay, a lesson to all you Bracophobes out there and those who believe in 'Caymanian' names. The name surname BRYAN is of patronymic origin derived from the fathers first name BRIAN, so basically meaning son of Brian. It is almost certainly of Anglo-Norman origin with some evidence of Irish gaelic along the way. However, so that we are all clear in our minds, BRYAN is NOT an indiginous Caribbean or even Caymanian name, it almost certainly has its roots in the UK (or maybe Ireland) where it is still in common use and brought over here by settlement and trade. The whole subject of family origin is one that should either be celebrated or ignored, depending on your motive for raising the issue. If those who question Mr Bryan's status as a true Caymanian care to look in the mirror or around their own family's and namesakes, they will surely realise that a Caymanian is of mixed origins and of diverse background. Get over it. Kenneth, please ignore the jealous crabs and stay your course. If education was the creditials needed to run this country we would all be up sh– creek. Let’s take Alden for example, He calls himself a Laywer and prides himself highly educated yet he managed to bankrupt the country in one single term as education minister with schools costing 200 million, hardly the paragon of good fiscal management I would say. For a lawyer and lets not forget “educated man” his speeking abilities are lacking, his debaiting skills are inadiquate, the unsuccessfully negotiated constitution for the people of this country… Is proof enough. I could go on but..
And then we have Mr. Ezzard Miller who brags constantly about his pharmaceutical degree who can’t even accomplish one thing except sit on the talk show and jaber, jaber, jaber all day long and run with Alden to the governor every second like little school boys crying teacher, teacher he hit me, and spreading lies and calling for investigations and corruption,, corruption, oh the corruption, quits everything and never has any stick-tueity. Then we have the honorable Kurt who has not accomplished one single thing for the country and its people for the past 20 plus year, since he hasbeen in parliament, except for spearheading the country straight to bankruptcy with an 81 million (US1 billion dollar) deficit which has now allowed the UK to controll our finances for the first time in our 500 year history. And then there is Arden “the Action Man” who did what ? Build roads – I will give him credit for that, but he cannot speak without crying “it’s neither fish nor fowl” I still cannot figure out what this mambo jumbo means even after hearing it for years now. As for other members – whom rearly even so much as utter a word in years making it obvious that not having a voice or even speaking, is not something held against you when vying for office. On the other hand, Mr. Bush who has no advanced education like the lawyers in the house has managed to aid so many. Why is that? Let me tell you, a good heart, good common sense, love for your country and ambition which you, kenneth, do not fall short on. And I may also add. I see much comparison to Mr. Solomon, you should be honored to be. For having been in office short of one term, this young man has accomplished so much, such as jobs for Caymanians, pension for Caymanians, human organ and tissue transplants, building affordable home using local contractors and local material, negotiating an excellent contract for the dock, using, again, Caymanian housing for rent, and Caymanian labour and materials. Also we are yet to see the education credentials for these other persons, such as Kurt, Arden, Ezzard, Mr. Eden, etc. We have heard it mention, or most continue to remain silent on this issue for fear of the spotlight on them, but where is the proof, has anyone seen this. If being a sailer on catboats qualifies one to be a captain then one would think having grown up in tough economic circumstance and making it to the top in your chosen field makes one quilified for public office. For who better to understand the needs of your people. It’s shows your ambition, drive and endurance. For as the good book says ” the race is not for the swift or the strong, but for those who endure” and to make it to the top takes time, patience (and yes one makes mistakes along the way) but it shows someone who is not willing to give up, who is not afraid of change, who will go the extra mile to achieve. Once again Kenneth, if you have a dream, the desire and the will and ambition to do so, please do not let the fools kept you from it. For God and only God can stop you. If you want it bad enough then you can achieve it. Education is not the ‘be all and end all to success’ you have to have ambition, for without it education means nothing (see Steve Jobs and Bill Gates for reference ). Go ahead love and chase your dreams. Do not listen to the Negative blogs, those are just people who are scared to even get up and try, so they try to stop you because you have the tenacity to do so. There is a term for such people and it’s called HATERS! (having anger towards everyone reaching success). This is truly one of the best comments and a great observation of our elected Parliament. Your post is ridiculous. The only thing that the UDP seems to be able to harp on about is how the PPM supposedly bankrupted us with its spending. But how is it that McKeeva could announce to the country that we were "broke" and couldn't pay our bills in August, 2009 yet in in September, 2009 the FS could write to Tom Jones International and say that Cayman was actually able to meet all of its obligations? Which one was lying? Why is it that the UDP does not want the govt. accounts 2008-2009 to be audited? Are they afraid that it might reveal that their cry that the country was broke was all an elaborate lie so that the people would give them carte blanche to do whatever they pleased? How would the country go from $81m dollar deficit in 2009 to a $20m surplus in 2010 in the middle of a recession? He has not explained the cuts that made that possible. If this country is so broke why are they giving away money to private individuals like the parking lot paving fiasco? BTW it is McKeeva that increased the cost of the schools from $119m to $200m. Are you really so stupid that you don't know that CI$81 million does not equal US$1 billion dollars? As for McKeeva helping people, the only people he "helps" are big developers like Michael Ryan who he allowed to renege on his obligation to pay $6m in deferred duties to this country, his cronies (like Prasad when it comes to importing dynamite illegally) and his WB supporters (at election time at least). Mckeeva Bush is quite simply the worst leader this country has seen bar none. For all the foreign travel and hoopla he has accomplished NOTHING since he took office three years ago. What he has done is to make a bad situation worse by breaching contracts and creating more liabilities. GLF cost us $3m. Cohen cost us $1/2 m and Tom Jones may cost us an additional $20m. He thinks like the child with the fifth grade education he was when he left school. That is why it never occurs to him that anything he is doing is wrong. That is why there are scandals galore. He makes this country look ridiculous by his stupid statements some of which have hit the international media. As for good fiscal management McKeeva is the guy who decided not to build schools or roads or a new govt. admin building – needed infrastructure – but to build Boatswain Beach for $65m which costs us an additional $10 per year to run. He is like a human tornado. He is a blight on this country and it may take us years to recover from it. May 2013 cannot come soon enough. That being said I don't think a tertiary education is a must for elected office although it may definitely be an asset. I will be listening to Kenneth keenly to hear what he has to offer. I hope that you are absolutely wrong in your comparison to Ellio who obviously saw politics as a means to personal advancement. All of his talk was pure hot air. "For a lawyer and lets not forget "educated man" his speeking abilities are lacking, his debaiting skills are inadiquate". It would be more impressive if you learned to spell before criticising the quality of someone else's education. It is rather befuddling to read how many ignorant and off topic comments they are. There are approximately 55K people residing in these islands, yet a few brave souls have the gumption to first leave a job during these austere times to offer themselves and by all standards the lives of their family to you the people. Truthfully, I expected to simply read comments from a more intelligent group such as but not limited to; First thank you for the offer to represent me, however, I need to know and understand what are your plans and policies are that will assist the Cayman Islands? Not ignorant, off topic, mud-slinging stupidity several of you took valuable time to write. I believe that all persons whom believe they are worthy of or have the ability to represent your interest, should be allowed a fair and reasonable opportunity to do so. Then, if their plans and policies either match or don't match your vision simply make your feelings known on the ballot paper not on forums such as this. Cayman, it is time to grow-up, failure to do so will mean you will remain as you are (divided and struggling). Moreover facilitating the continuance of being portrayed as easy targets to take advantage of because it is so simple to divide and conquer to the benefit of all others but the local. Hence the 13% unemployment rate! Doh!! It's 9% + actually, now whose mud slinging. Should Mr. Kenneth Bryan take the decision to put himself forward as a political candidate in the May 2013 general election, I Quincy Brown will endorse him for a seat in the GT constituency. The basic salary for an MP in the UK parliament is £65,738 ($CI85,000) a year and the average constituency size is 70,000. A member of parliament able to win the support and the votes of tens of thousands of voters in a constituency is more than capable of obtaining a job paying considerably more than that not only in the private sector but in the public sector too. For example there are more than 1000 head teachers in the UK earning more than £100,000 ($CI130,000) a year. Generally, people don’t enter the UK parliament for the money. Compare that with the situation in Cayman where an MLA earns nearly twice as much as a British MP and represents fewer voters than may be found in an English village. How many employment opportunities are open to Caymanians, with qualifications or not for the salary enjoyed by an MLA? It is no wonder that those lacking talent but with personality are attracted to politics in Cayman. There are town councillors in the UK with more responsibilities than more than half of Cayman’s MLA’s. In what other occupation could most of the present MLA’s “earn” the money that they do? Here, here, well said and oh so true. It's just another example of an over inflated opinion of their own abilities and worth. However, thats not exclusive to just MLA's, ordinary Caymanianscomplained on last nights C27 of an expectancy to work for low wages to reduce the unemployment figure. If its so bad why are you happy to employ expat workers for low wages and long hours and why do you figure that it is acceptable to remain unemployed rather than do any form of meaningful employment? If you are that desperate to reduce the unemployment rate then swallow your pride, re-evaluate your abilities and get to work. Many people strive for high ideals but…. The young was brainwashed by the Puppet Premier while he was touring with the government some weeks ago. He saw how good things can be…at the country's expense. If he does run, he will be UDP. Ok lets see: Johan Moxam, Bo Miller, Stephen Baraud, Garth Arch, Mike Adam, Mark Scotland, Matthew Leslie, Arden McLean, Ezzard Miller, Rolston Anglin, Bernie Bush, Alden McLaughlin… I could see that as a Government. Some young some old and experienced but can make a great coalition. It is an unpalatable fact that when one witnesses Caymanians indulge in political debate, they immediately resort to petty and juvenille name calling. Just read though most of the comments posted about this young man and you will see everything from the island of his birth, his looks, his childhood, his family and his education. For heavens sake grow up and let this young man present his credentials before knocking him down. Good intention will not be enough, he must have an understanding of how the world in the 21st century operates and be able to form cohesive policies for the good of all residents of the Cayman Islands, not just the few. If the Cayman Islands are to become a respected member of the worlds community and share in what the world can offer, her people must recognise that intolerance, bigotry and racism has no part in a modern civilised society. Caymanians are not an indiginous race and do not draw their history from any one quarter. They are a mixed race people from various cultures and backgrounds and should celebrate their differences as well as welcoming those of good character and industrious disposition to their home. Unfortuantely, that is not yet the case as can be seen from this article and subsequent comments. Some still hold on to antiquated ideas that are better suited to the 18th century, lets hope this young man has a more forward looking view than some of his blinkered contemporaries and seniors. It only takes common sense to manage the needs of one daily life (people of Cayman Islands needs ) and I’m more than sure Kenneth Bryan once place in parliament will see to it that the “NEEDS OF HIS PEOPLE ARE TAKEN CARE OF”. Caymanian by birth or however you hold your Caymanian rights need to stop and work together in order to place the Cayman Islands back to a place where everyone can live and want to live and not just a crime show case. For those who don’t know Cayman history the name BRYAN is very much a Caymanian name from Cayman Brac. Aaron Bryan (born on November 18, 1861) who was the first deacon of Spot Bay Baptist Church and the grandson of Simeon Bryan born in 1830. Do you now see the name BRYAN in Cayman Brac history and also note that the Cayman Islands are made up of three (3) islands and not just Grand Cayman. I was told that the young ones are your future, so tell me why KENNETH BRYAN or any other young Caymanian can’t run for the next election in 2013.The time you take viewing Kenneth’s past life, you should try making appointment to see him on how you as a citizen of the Cayman Islands can make a difference in making the Cayman Islands a better place to live not just for you, but most of all for your children future. I’m here to say that I support Kenneth Bryan not just as afamily member, but as a young Caymanian making changes that are well needed within the Cayman Islands. Richard Branson left school at 16. Patterson's Son, Rudy probably left early as well. Yes, but his daddy was rich and ploughed tons of money into the newly formed Virgin Records. The myth that Branson is some kind of working class hero made good against the odds is just that, a myth. He is undeniably a canny operator and his businesses are very successful enterprises. However, he rarely misses an opportunity to portray himself as some kind of David fighting against the Goliaths of the corporate world, probably a throw back to being bullied at public school. There is good and bad in everyone of us no one is better than anyone, we are all human beins and we all make mistakes alot of us would love to go back and change the past but we cant and we have no other choice but to move on and try to make our lives much better and become productive citizens. Always remember that no one is perfect but God and if there is any perfect person in this world then something is wrong with him. My Caymanian people what our real problem are …is that we all tend to judge too much and we all talk things that we dont know or have the facts about just to stir up a little trouble and get a little attention and excitement going especially when it comes to politics….A LOW DOWN DIRTY GAME…. I too have known Kenneth from Brac High. We fought a few times ourselves, but would like state that every time we see one another since the high school years we greet one another. We've both done very well for ourselves despite the warrior behaviour on the BB court. He's a good guy who's always had a big heart. I'm sure he'd do better than some of the folks there now. As a voter, may I just confirm that I am interested in your qualifications and your proposed solutions. I so do not care to verify how much generation of "Caymanian" you can go back, or that you used to fight in high school. I am interested in RELEVANT information to assess your suitablity to represent my country. Girl, you na see his surname is a "BRAC NAME' so thats why he getting negative comments. They na like a bone in us but we as they can all see, we STRAIGHT TALK! I cant wait see some comments later with the "Brac Bashing"! oh but when they want Naseberrries they callingeverybody and dont forget them cowshit bread "round hard dough bread". watch out now cuz Brac Jackpot this weekend and everywhere booked up so there goes the few lil naseberries. I hope all the solja's take shelter this weekend. You're a classic example of why ppl in general think "Bwackers" are stupid! Funny how people think Brackers are stupid when they run majority of the successful businesses and high ranking positions. Bet if you were to do a comparison they would clean us up. I'm checking in on Dart-must be a Bracker too! LOL! Bracers are the people who made grand cayman and the $$ people in cayman considering the population ratio to grand caayman to cayman brac i think G-cayman people are dumb!!! It's stupid Caymanians like you why we have the problems we face today with our youths. Kenneth's personal life has nothing to do with him trying to run for election. Jeese, the people need to have a personal life and not a life just for the community, come on man, give the young man a break. Having said that, i went to school with Kenneth and lived in Spot Bay not too far from where he lived. Never in my life i would have taught he would have made it this far in life being in a single parent home or the lifestyle he chose as a young man. However, as the ole people would say, its not where you are coming from, its where your headed. I feel proud to know that Kenneth have come such a long way. Take Obama for example. Let's stand up and give Kenneth the support even if he does not succeed. I am proud of Kenneth for having the balls to come forward and not being ashamed of his past. I can't seem to understand some Caymanians, one minute they putting they own Caymanians down, then when expats doing something it's another story. Well he's a Caymanian so let's give him the support. Christ he cant be no worst than whats in the house now. I am sure he would be a good example of our young men of what he has been through. I say to you, keep you head high and dont let no one put you down. I am sure your Grandmother (RIP) taught you some important things in life and I am proud of you. Remember, put your community first and not self as you have 2 kids and would love your kids to see a better cayman. So, until I see you again in public to shake your hand, Good Luck and all the best. You were doing well till you mentioned Nobama. Also, I get very annoyed with people that will vote for people just because they are friends, family, east of the tamarind tree (idjit above), etc. I know Kenneth as well and have nothing against him but people like the ones above will turn people away from him. The east of the tamarind tree mentality is no better than the West Bay mentality. I want to know Kenneth's qualifications not whether he is Caymanian many generations back as few can claim to be. Everyone needs to remember that every Caymanian is mixed and some bloodlines are stronger than others. Like another poster said, we are British and African mixed. Thanks Kenneth, I will support you in this venture. Yes, we have all made mistakes that we are not proud of, including myself. Even though Kenneth has matured and changed since his life of partying, drugs and being a bartender etc. I have to ask as a even younger Caymanian, what does he have to offer? What is his work experienceand what is his educational background. I am sure he has a lot of good intentions for the country and his people. But we need people who are business smart, and has more than a high school education. WTF, we have Mr Elio Solomon negotiating multimillion dollar contracts does he really have a clue what he is doing? Our Premier did not graduate HIGH SCHOOL! OMG is he the best that Cayman has to be Premier- a high school drop out? Really ? We need people like Chandra Glidden, Garth Arch etc to be in our office ! come on Cayman I am sure there are no high school drop outs in the White House or in the House of Lords! Uneducated politicians have done nothing but embarrass this country and it has to stop! Young Caymanian or not, I will not be giving my vote to him I am sorry. Get some education and business experience, and try back in about five years Kenneth. It is indeed strange and disturbing to read some of the comments, that some self centred bloggers have posted. If you fall, get up and shake the dust off, cover the wounds, they will heal. Stop putting our young people down, offer them your hand to guide them over the rough roads and they will become better people. Not every human being has had the smoothe path to success. Remember, 'Success comes in cans and failures in can'ts'. What a depressing post, you say being a bartender-like that's a crime. You dredge up his past and try to sully his character with references to partying and drugs. So what? I would much prefer a reformed rebel to some of the morally bankrupt so called pillars of society with their rank hypocrisy that younger Caymanians like yourself admire. Kenny had a tough life, one which you wouldn't appreciate. Wipe the wet from behind your ears if you think education makes for strong character. See Bill Clinton, Richard Nixon or Tony Blair for good examples. In time of war on the battlefield, would you rather have a partner who has a degree; or, would you rather have one who is intelligent and have common sense? Alot of people are hurting right now in Cayman. The well-off few are living life and can afford to pay their bills from month to month. Who would you want to represent you??? Just because someone says they have an education and knowledge, does not mean they have wisdom. If Kendecides to run, allow him! So what if he does not have a degree in political science. In the Constitution, does it state that you must have a degree to be an MLA? Of course not. There are many educated people who lack emotional intelligence, lack charisma, lack up-and-go, and that is why employers are hiring people without degrees, because they are always willing to learn and listen to others. They never claim in pride that they "have it." People want people with character! It is simple to understand Unison's statement. I own a business with 14 employees. Only 2 of them have degrees. I pay several of my workers more than them. You see, I rate performance differently. I don't automatically give preference to someone who has papers. I know many business owners would think the same. Kenneth is my 'baby' brother. Let any one of you who whether presently in the house of Parliament or otherwise who do not have skeletons in his or her closet step forward. That is the problem with Cayman now, always bashing our own. And that is why politics, the present Polititians and the country is where it is at today in Cayman is because hardly anyone new and or fresh has come forward, aside from West Bay. Young people in Cayman is ready for a change, and anyone and anything looks good when change is desired but it takes courage to come out on the limb to take a chance. Kenneth knew and prepared himself for this day. And nothing any of the writers here say will deter him. Those who really, genuinely knows him will know he is determined and persistant, and can be like a true island boy – bend in the wind like a palm tree when the breeze becomes too strong. Many of you who take objection would not have the courage to do this. If anything he should be a perfect Caymanian example of reform, since some have so much to say in the negative. On a closing note – I pray for my brother that if he decides to run and is favorable–he will remain with dignity, courage, morals and be an honest, humble and humane person with standards. Most of al if he is elected he wil remember WHO put him there and WHAT purpose he would serve! Could it be that we need someone to hear those who feel that they have no voice. When people have no food to feed their children when good people have no jobs to go to, are they concered about who is going to build our ports or whether Dart will take over the westbay road? These issues are very important to our Country yes, but maybe Kenneth might be the person to try to assist those who are not being heard. He has come from hard times, he knows what it is to have nothing and become something. He is a positive role model for our young men and women who come from a world which some people in Cayman (including those in our Government) do not understand. I believe we need someone like Mr Bryan to connect with the people and look to a better future for everyone in Cayman not just those with tertiary education and large bank balances. Well, where do you think those jobs that will pay for the food for the children will come from..? They will only come from good fiscal management and a government that can muster enough financial and business acumen to create the ecomonic climate to support entities which can, in turn, offer jobs to local people. Just because the current administration (and previous, for that matter) have failed miserably doesn't mean that we should turn to unqualified, inexperienced newbies and expect jobs and prosperity. It's not a pageant – whoever will lead the country out of this mess will have to make some difficult – and most likely unpopular – decisions with long-term propsperity in mind. I'm sure Mr Bryan is a good man and could work wonders as a positive role model in some other organisation, but high-level government just isn't it. I understand that jobs need to be created hence why I say that these issues are important to this Country. But, while I know jobs or the lack of jobs are part of the problem I also realize there is much more to it. Alcohol and drug abuse, domestic violence, education, gangs, crime, a marginalized population with very low expectations with a vast population thatin turn do not expect much from them. Narrow-mindedness and closed hearts is a huge contributor it’s not just about the dollar. Cayman is small enough for our politicians to still be able to have a direct impact on these areas they don’t only need to have knowledge of banking and business to know what is necessary to help our country grow in the right direction. Unbelievable!!!! Here is a young Caymanian who is doing something positive and they are more comments on this page bashing him than encouraging his efforts. Please be reminded that a politician is a REPRESENTATIVE of the community. All the business experience, education and good upbring means nothing if your heart is not to serve the people who you were elected by. How many of you so called commenters are registered voters? How many of you go to the meetings? How many of you are willing to go out in front of a crowd and protest the BS that you are siting and watching these madmen do to YOUR country? When you see Kenneth running at elections and you don't like it, maybe you should have been the one to get up and dedicate your life to serve your fellow country men. The biggest problem with this country is Caymanians always tear each other down. Kenneth good luck to you!!! You represent a generation of change. 13:07 do you see what I am saying. This place here Cayman is hopeless. I know Mr Bush is sorry that he gave certain people Cayman Status because they are turning around and biting him and every Caymanian in sight. Anyway it is human to err. If young Bryan runs I will definately be supporting him. Lets see how many Caymanians is still standing up for their own now. Although we know the bad mouthing and thumbs down for young Brian is not true Caymanians. I only just hope he has enough time to realize this before election. He will soon find out who is doing and saying what. All Caymanians lets support Young Bryan for politics. He is a Bracker and the real Bracker do not stand for foolishness. I've known Ken for a long time. He's had some hiccups like most of us, but has done good for himself. As for the name-it's truly a Brac name. I recall Mr. Ren Bryan and Ms. Andrea Bryan who all come from the Brac. Not that that should matter too much. It's encouraging to see a young Caymanian step forward and take an interest, but it would be more encouraging if he had an education and some practical experience in economics, finance, business or law. We already have an LA full of people without these skills and that needs to change. If you google him, the first result is his dating website page with saucy photos which are frankly unbecoming of anyone wishing to be taken seriously. Things coming out of Cayman never ceases to amaze me ! Elio Solomon has obviously proved that all it takes to win political office in Cayman is good looks, the ability to speak well and articulately….and follow the party line…and you're in line for a fat MLA check each month and the perks to go with it. So now we have an Elio-clone following in his footsteps ?! What education, experience and understanding of life outside of Cayman does this young man, regardless of how popular he is, have to bring to the table in the serious job of legislating laws for the good of the Cayman Islands ? Lord have mercy on Cayman ! I just hope he has an in-depth understanding and knowledge of government and economics, the balance of trades, and that he is financially astute – otherwise like you say Lord have mercy! Well, at least my comments got some people thinking..and responding. What I'm saying is that…I know Kenny Bryan from the 7-Mile Beach social/party circuit as well as anyone else commenting here…and that has nothing to to do with my comments. You're no one in Cayman, if you're no one socially…so there's no problem there. What I am saying is that to be a legislator in the country, a candidate should at least have some of the required attributes, experience and qualifications. I will ask anyone posting here in support of Bryan…when the time comes to mark your X beside his name on a ballot paper…what criteria will you be using to give him your vote ? If the reasons that you are giving here is the reasons you would vote for him…then no wonder Cayman is in the mess that it is today. Its not the candidates….its the voters who are grossly unqualified ! As I've said before…Lord help the Cayman Islands ! Well at least your tirade admits that Ellio has good looks, the ability to speak well and articulately. Where you do go wrong is failing to realise (or also admit) is that Ellio has also demonstrated a willing to stand up for the ordinary caymanian. Ellio has ensured that local contractors got to build every affordable home – and they are all out of concrete (no zinc like someone did before using foreign labour). "At last count I believe, on average, 1 Caymanian everyday was using this Law, which Ellio brought"
WHOT are you saying here? Ludicrous. What 'last count'? On average? 1 Caymanian everyday…what? Nonsense. Elio is an unqualified, loud-mouth fop. He is no more qualified than Kenny Bryan. And since- evidently, you think Elio is doing a good job despite not having any education or work experience – no one should be hating on young Kenny Bryan for wanting a try. 11:51 I hope you really dont think that we believe you are a Caymanian? No, No, No. We know better than that. Bryan do not let them discourage you. They will try but they can only write Bullin anonymous. We will stand up for you when the time comes. Wait… you think Ellio is goodlooking, speaks well and is articulate? Back to your first statement – you truly must amaze easily. I do agree with an underlying argument here – that at least the young meat need some credentials. There is so much more potential, so much more opportunity to be educated in your relevant field and, as a young Caymanian, I can confirm – we exist now! That being said I do give Kenneth credit for how he is handling this situation and if you dare step up to the plate, promise us you'll actually contribute to the change we desperately need. Agree with all you say except the good looking part. There are many unqualified nice guys with basic education who see the salary and benefits, but are not intellectually mature for the challenges of the post. Once in power they get themselves expensive German cars and slowly forget the duty of responsibility they owe the voter as the 6 figure paycheck rolls in..
No offence meant, it's just how it is. Sounds like someone is Jealous. Please call 1-800-jealous for some counseling. It shouldn't matter that Alden has a BMW – he has worked for it. I'm sure if Ezzard could chew gum and walk he would buy a car too. "Elio Solomon has obviously proved that all it takes to win political office in Cayman is good looks, the ability to speak well and articulately….and follow the party line…and you're in line for a fat MLA checkeach month and the perks to go with it." Of the three qualities you have claimed Mr Solomon possesses, i say that it is a matter of objective fact that he does not possess two of them. First Ellio, then Kenneth, then Austin then Gilbert wiil try to ride the radio/tv personality to the promised land of nice cars, a cushy job and pension for all their efforts. And because they have an outlet to be seen and be heard, people think they're great. Sorry, folks, there's not a single one of them who will do anything beneficial for this country, and that includes Gilbert. They are not worthy candidates just because they can state their opinions. We need highly educated leaders. We don't need radio and TV personalities. I for one an impressed that Mr. Bryan has taken the high road and the honourable path. Unlike others – take Ellio for example, Mr. Bryan recognizes that credibility is important. Yes, he has had a rough life but that is what qualifies to speak for those who are ignored. He can provide insight in why so many are still strugging and is willing to look for solution. There are not many people who would walk away from a steady job and he deserves respect and admiration for following his conscience. Those who have never fallen fail torecognize how simple their path has been. Those who have fallen but strive to rise are extraordinary and we should listen to what they have to say. Mr. Bryan wants nothing more than to serve the country. Interesting so many of you ask about qualification as though living in the school of hard knocks isn't qualification enough. I totally agree with the comments on Mr. Solomon. Myself and four of my girlfriends were talking politics and we all agree that Mr. Solomon is a very good looking man, speaks exceptionally well and is very articulate. We believe his motions have been the best we have seen, so many Caymanians have benefitted from his motion including the five of us. The UDP’S would be nothing right now without Mr. Solomon and McKeeva knows it too. Ellio Solomon for Premier. Go Mr. Solomon, you have our votes come 2013. Did the Jordanian get English lessons? I too have known Kenneth through the bad and the good and have seen him grow up over the last few years. Nothing wrong with making mistakes as long as you do not hide from them. They can't hurt you with their words if you have said it first. Full disclosure Kenneth. Take this time to seriously think about what you can offer this country – don't make empty promises – really, really think about what you say and promise to your country. Find a good mentor and settle in under their wing for a good many years – you are young Kenneth and have plenty time to make your mark in Cayman's history. Whilst there go back to school to further your education. Learn, and learn well, my friend. I wish you all the Best Kenneth. You cant do no worse than what is being done now, you will only be taking up where they left off. Out with the OLD and in the YOUNG!!!! I respect Kenneth's responsiblity and professionalism given a possible conflict of interest situation as a reporter of news shows good judgment. Not knowing him beyond his public image, this decision speaks well of him. Lets wait and see if AUSTIN HARRIS or GILBERT MCLEAN resign given that they intend to run in the next election. They say they haven't yet decided. as a Caymanian. How many generations! Bryan is not an original Caymanian name. Mr. Bryan you should secure work before quitting your job talking about Cayman 27 and also many politicians have almost starved to death if not elected. Don't wind up like some. People do not like to hire politicians who lose, the PPM won't help you financiallly but the UDP will at least help you to gain employment. at least Big Mac takes care of his people. I noticed from a long time now that something is very wrong at Cayman 27, since there are now changes. I don't see that beautiful lively delightful smile on Donna's face anymore, so I am certain something is very wrong at that TV station. To Anon 07:39 – What is your last name and where did it originate???? Bryan is a 100% Cayman Brac name. Actually it is the Brackers (who refer to people from Grand Cayman as "Caymanians" as distinct from Brackers) who don't seem to recognise that. How far back in time do you have to go before a name is "orginally Caymanian"? Given that all Caymanians are the descendants of colonists or slaves, how do you define "foreigner"? On one view, anyone who isn't a Bodden is a johnny-come-lately, foreigner type. 09:47 got to admit it. But It so happens that the Cayman decendents came from the English man the scotish and the African slave. See how brown and black skinned Caymanians have green eyes, yellow eyes, straight nose and that pretty brown carmel skin. We are toosweet, this English African mixed breed. With a touch of caribbean indian and spanish and who knows what else. Last time I checked Caymanians are descendants of slaves, slave masters, pirates and sailors. Perhaps you should check out where some famous Caymaninan names originated. You obviously do not know much about Caymanian names or the Brac. Bryan is Caymanian and there are many in the Brac. And ……………… who gives a s….t what his name is. What is important is whether or not he is a good or bad candidate and what is he bringing to the table. Comments like these really really get under my skin!!! I mean we are already a minority in our own country quite possibly only 20+k yet we still have people who insist in tearing down and reducing that number even more. I just can't understand this mentality!! It truly disgusts me. Here you have a young man who is taking this major risk for love of country and before he is even out the gate properly we have already started to tear him down and worse question if he is Caymanian enough??!!! My goodness man we have to do better than this. How can we really have true national pride when we cant even agree on a bloody definition of "Caymanian". We have messed with that definition so much over the years that it is just one big pile of confusion. Join the real world you racist bigot, we all belong to it. There's no such thing as an indiginous Caymanian, you are all from somewhere else, probably Jamaica, Honduras, Cuba, UK, USA or one of hundreds of other nations around the world. The only reason why you're a minority in 'your' own country is like most other developing nations, you don't have the population to support the skills base needed to generate the wealth that you all crave so much. Without new citizens or residents this country would be just another rock in the Caribbean, not an off shore financial and legal centre that puts billions in government coffers. Without the expat workers you would have no tourism or service industry, who do you suppose would serve you your cold beer at the end of the day or clean up your streets. Who do you think would shop in your supermarkets or support so many local businesses injecting hard earned cash to the local economy? Go back 50 years, this was a quiet back water in the middle of no where with a tiny population. Who do you think brought all the business and the wealth to these islands and where do you think you would be without it? Lets take a guess, with such a mix of races and cultures, probably sitting on a porch, (with the rest of your indiginous/genetic family) some where else in the world. One things for sure, the subsidies that you currently enjoy on medical, air fares, property purchase taxes etc, etc… would all come to a crashing halt without those who come to these beautiful islands and invest their lives and treasure. Stop being an isolationist idiot and look at the bigger picture, hopefully this potential politician has more than his fragile identity to worry about. This is a mischievous post. The writer obviously thinks that Bryan will run with the PPM and is trying to discredit him in the eyes of some PPM voters. I believe young Bryan is sensible to know what is going on in Cayman. Also I do hope he will not think about running with a group who has made no preparation for its people. There are persons who are planning to run and do not care too hopots about Cayman and its people. Don't be one of them power hungry bashing ill forgotten trouble makers. Concentrate on what is happening in Cayman and ride with the cowboys who has a plan to mend the fence. If the PPM and UDP had decided to work for a better Cayman we would not be in this mess. But all you can here is I object to this and I am digging for that foot stomping and marching around the assembly with not a clue in sight as to what is happening. Look learn and listen Bryan you are going to make it. Hey idiot, no such thing as a Caymanian name, they all came from other countries originally, mainly the UK. How many and how far do any of you 'Caymanians' go back and can you trace your genetic purity to a single founding family and be sure that 'foreigners' haven't diluted that purity over the years. After all, Cayman's population has only grown since the advent of off shore banking and mass tourism, so who are all of you 'Caymanians' and where did you all come from? One things for sure, just because you may share your name with others it doesn't make you family and it certainly doesn't make you a Caymanian. Good for you Kennith. I have heard of a few young Caymanians looking to run. Just a couple weeks ago I saw on Facebook that Matthew Leslie who is also a young businessman looking to run for office. I would encourage others such as Garth Arch who just won the YCLA Award, Collin Anglin, Richard Christian, Denise Miller, Stephan Baraud, Wayne Kirkconnell, and the many other successful young businessmen to take advantage and clean this country up. Could you imagine if all these bright young minds who have obviously made it in their fields of business came together as one? Unstoppable!! I totally agree with you on this one. For years it has been the same politicians flip flopping in power with none accomplishing much other than what they can gain in the pockets. I do believe it is now time to change the old guard and give a fresh new approach to how this country is ran. Mac, Kirk, Alden and especially Tony Eden…all you guys have had many years. Go enjoy your big fat pensions. Let the young ones come and take their rightful place and start to change the image of this country. Be there to advise if you feel like it but it is now time to have fresh ideas and new approaches. Kennith you can do it. I have seen you come from a nobody and become a somebody. As for the rest of the people mentioned I know everyone of them and I really believe they all would add life to the House and do what is right for the country. I hope they are reading this and will take into consideration the chance to run in the next election. Personally I'd support Collin Anglin, Wayne Kirckonnell, Denise Miller, Garth Arch and Stephan Baraud… not too keen on those other names with the exception of Kenneth Bryan who has proven so many people wrong to become the person that he is today. Matthew Leslie, Richard Christian, Collin Anglin ans Stephan Baraud are all UDP yiung top dogs. Wayne Kirkconnell and Denise Miller are PPM Top Dogs. Unless they distance themselves from the old regime and come with a fresh approach then its just a younger generation of the sake ole politricks. I gues you don't know any great Caymanian women? Denise Miller is a great Caymanian woman. Garth would probally never run as he can make a living without getting that big fat politician cheque. A fantastic guy, and well capable they are the kind of leaders that we need. Also Stephan Baraud another great guy. I do believe we are going to have alot of new blood this time and I would thank God Almighty. XXXXX Its time now for all those oldies to retire and let some others get a piece of the pie. The issues at hand are suited for an experienced and educated individual. I suspect Kenneths one skill will be in public speaking. I applaud his interest; however recommend he return to school and beef up his resume and credability. *Going forward can we keep the notion of god out of politics. Too many politicians hide behind "Praise Cayman" in order to secure votes. In the end we get a looney leader who qualifies everything with faith and hardly anything with logic and evidence. I would agree he is quite talented at agruing a point, which serves politicians well as well as lawyers. Sorry Kenneth, I applaud you seeing something broken and wanting to fix it but politics nowadays are a ugly game where the dirtiest win. I don’t think you are ready Kenneth ! I believe you quit your job prematurely. Reporting on the news doesn’t make you a politician. It makes you a good reporter. Ellio used the news too to get in. Or talk show I should say and then comes Austin and now you trying the same thing. Why not go and get formal tertiary education first, street smart is good but you need a proper balance. Too many times persons put themselves forward for election and they haven’t taken the time to understand all sides of the political arena. They are not fully versed and make poor and uninformed decisions. Well rounded individuals will make the better choice. I do however, admire your desire to serve your people. Getting someone from the financial system would mean getting Mr.Truman Bodden, he balanced the public purse, people were employed, and he kept a surplus inour budget! They should have elected him in 2009 but he did not run. qualified as a former leader of government business. but these people usually do not want to get into politics in a corrupt society! He mentioned lately that he would run for politics and ensure the law students were given the opportunity as articled clerks. He had a law firm, why didn't he do it? Or did he? I know of Adriene Webb and Karen Thomopson working for him but i think all others were foreign, he needs to let us know what his hiring record or partnership is with his own Caymanians. Just what we need, another journalist in politics to lead this country! Where are all the business trained individuals that have the common sense to lead a country? Why do we leave the running of the country to the people who have the biggest voice with the smallest brains? I'd love to hear that we have someone from the financial sector that might be able to lead the country out of the mess these previous clowns have led us into. My2sense! You go there Kenneth old buddy, we right behind you all the way. We need young, fresh, itelligent Caymanians in the house. Congrats Bro! Kenneth Bryan is a nice young man, whom I think would make a good politician. He has been out in the by ways long enough to have observed the good, bad and ugly of Politics in Cayman. My advice to him would be, put God first in every thing you do. Although that does not necessarily mean you won't have rough seas. You will. But joy will come in the morning. All the best going forward Kenneth. If you do decide to run I look forward to a fresh approach to the issues facing the country as you will be a fresh addition to the playing field. No doubt there will be some naysayers along the way – maybe even within this very thread – but so long as we are able to identify in you a desire to put country before self then you will deserve and receive that chance. Oh good lord, help us! Wow, I taught this guy at school! He was a BIG BIG troublemaker. No idea he had done so "well" since. I am a Caymanian, and have lived in Cayman all my life. I have seen many young Caymanians at school who were Big problems then. Children whom we said and thought would have turned out to be nothing. But I am still living to see those same children have grown up to be fine young men and women in this community with BIG TIME JOB POSITIONS. I am saying this to say. DO NOT WATCH NO FACE. There are many among us who do not support our youth in our out of school, we critize and critize and critize, but those same raga-muffin government school kids have shown potential to become someone very important. Last but not least, It is very important to give these Bad troubled children a chance to make something of themselves if you intend living in Cayman, because one of them may become your daughter or son in law, one day and you cannot do a thing about love. "I am saying this to say. Do not watch no face". Thanks. That was helpful. it means, "I'm not embarrassed to say… or Don't worry about what anyone thinks…" in Island Lingo and is used through-out the Caribbean. be nice to the indigenous for once, nah! dang. At least he went to school. Dang youre negative, I hope youre not teaching my kids now!!!!! Tues 7:40: No not negative. Absolutely totally factual about the past with reference to a specific case.. And yes, I might be teaching your kids right now. You might be able to help me. Are they the disruptive, constantly shouting out in class, uninterested in structured schooling, impolite, bullying in the lunchline, sometimes violent and threatening towards other students and teachers ones (the minority thankfully) or are they part of the majority of largely pleasant co-operative kids? Hopefully you will know (I suspect from your post you will) but trust me there are many, many "parents" out there who have no idea how their kids are doing and who could not care less. The Kenneth I knew 6 years ago is not the same Kenneth I know today. He has grown as an individual and become a better person than he used to be. I would fully support him if he chooses to run (the Kenneth of yesteryear is a different story). I am VERY PROUD of Kenneth regardless of the issues he had in his early life. He is doing extremely well and should be commended. I taught him for a number of years and would NEVER bring up old time stories. Is he ready for politics? He and the people will have to decide. Give thanks. Ken, I am anxious to know your political persuasion? Please affirm your political persuasion and refrain from being like the others who are mute to where or how they stand on issues. Apparently to this date, the UDP and PPM parties have not establish a political platform. Alden flip-flopped on rollover policy; McKeeva on projects. Voters ought not to be left in the dark, left to vote based on personality instead of issues. Ken, I wish you the best, but I caution you, if you have not a vision, outlined goals, a strategy, a sound political ideology, and brawn and patience to lead, I recommend you not enter a playing field where so many dogs barking at possible corruption. Now wouldn't be the time to get yourself mingled up with the wrong crowd. If you do go in, I will support you for your views and independence. Many would so long you are not bought or sold and put the Caymanian and local small businesses first. God be with you, my friend, and my prayers on you and your family. M.
19:42 you have some good points in your comments, but I say leave the young man to decide for himself. Do not push, rush, drag, speed race or try to influence him. By the time six months come I am sure he would have decide. Right now I would say to Kenneth. " Watch and wait." You will see it all unfolding before your eyes, and remember the words of a Post I read on here. "Joy will come in the morning". Kenneth my boy it is time you look beyond the Horizon and see how much time Caymanians have left, because we are slowly falling. So if your little hands can do anything to help prop the rock from rolling off then I am there with you by your side. You will see that in given time..